Omari is 16, maybe 17 years old and he’s in serious trouble. He’s black, a bright kid, from a decent family. True, it’s a broken family. Omari’s mother, a high school teacher, and his father, a lawyer, are divorced. They’re good people. They send O – everybody calls him O – to a private school. The boy is deeply angry, and now he’s facing expulsion from school, and maybe much worse, for assaulting a teacher. This the perilous crux of Dominique Morisseau’s play “Pipeline,” on gripping display at Victory Gardens Theater. Tyla Abercrumbie portrays a frantic mother desperate to reconnect with her wayward son (Matthew Elam). 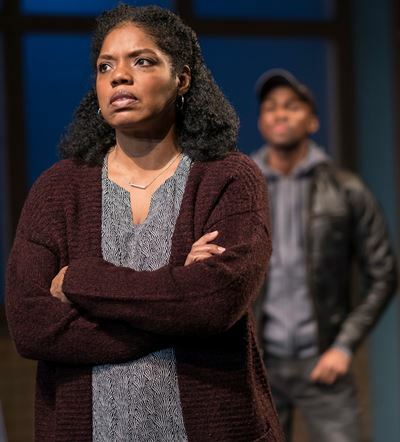 Omari’s mom, Nya (played with loving conviction and wrenching anxiety by Tyla Abercrumbie), is panicked. She does not teach at a private school; she tries to keep order and sanity while spreading light at a public inner city school in a metropolis. Nya is very familiar with anger and violence; she observes it every day. She knows where it can and does lead, and she’s deathly afraid that her son will be turned out from the protective environment of a private education. Actually, he’s facing charges; in reality, this smart young man from smart parents is staring at the possibility of prison. Not just because he pushed a provoking teacher against a blackboard, but because this latest offense is his third strike. 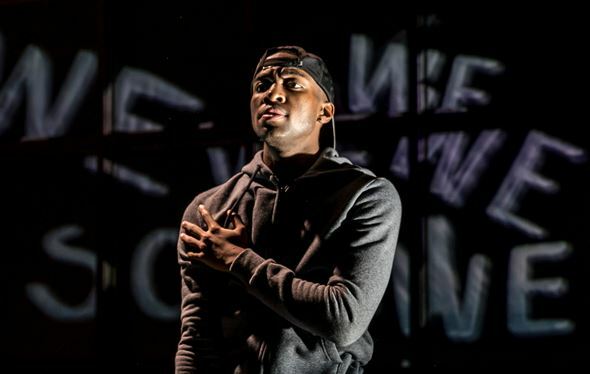 In the back of Nya’s mind, but in our full gaze, Omari (the dazzling Matthew Elam) raps out the words as they are projected graffiti-like on a rear wall. Omari is already beyond his mom’s reach. Enter middle-aged Xavier, the man, Dad (Mark Spates Smith). He’s got this. What the boy needs is discipline. Nya is too soft. Omari needs a man’s firm hand on his shoulder. The drill instructor will now take over, shape this boy up. Omari’s imperious father (Mark Spates Smith) enters the picture, ready to take command from his ex-wife (Tyla Abercrumbie). 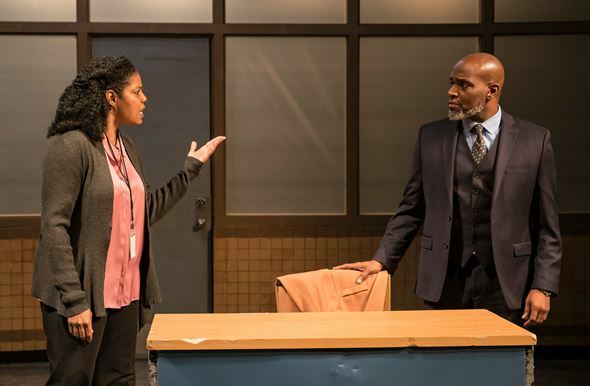 What follows is doubly marvelous theater: brilliantly concise and pointed writing by Morisseau and breathtaking delivery by Elam in a crushing monologue. At first, the old man is in Omari’s face – or rather, just behind him, on his neck, making imperious noises as if he expects the boy to reply meekly, “Sir, yes, Sir.” But that ain’t happening. With consummate control of text, temperament, inflection and his own body, Elam’s long-simmering O lays it out for his dad: this man who writes the checks that show up regular as clockwork even if their author never makes the scene. Omari recalls studying a familiar envelope with its reliable contents and wondering who, or what, was actually the source of this cash expression of support. Was it his father, who never had time for him personally, or was it a bank computer that kicked out the expected dole with such unfailing punctuality? O’s speech evolves through a winding moral indictment and it ends with a fierce, categorical repudiation of his father. Nothing is left for the drill instructor but to do an about-face. Janet Ulrich Brooks plays the ever-kvetching, very funny white teacher. Omari is still in hot water at school, but he eventually tries to explain to his mother how it went down. The class was studying Richard Wright’s novel “Native Son,” and the teacher began pressing Omari for his interpretation of the hounded protagonist Bigger Thomas. Sensing that the teacher was comparing him to Bigger, O felt himself suffocating, felt like the walls were closing in on him, had to leave the room. Without permission, he rose to go, but the teacher got in his way; Omari removed him, against blackboard. None of this is OK, of course. Nya reminds her son that teachers are there to prod, that the classroom is a dynamic space. Ultimately, she breaks through with an appeal: that Omari instruct her. How can she help, what does he want in order to establish communication, what are his ground rules? So Omari lists them. My favorite: Don’t push me…except when you really need to. There is no promise of happily ever after here, but there is light and there is connection. Smart boy, savvy mom. Good chance. 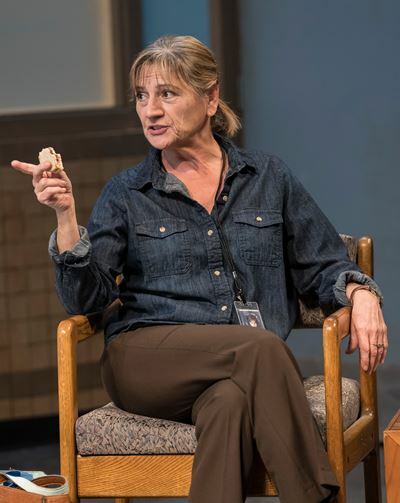 The consuming intensity of “Pipeline” is relieved by two very funny female characters: O’s classmate and girlfriend Jasmine (Aurora Real de Asua, by turns deliciously wry and dryly direct) and a foul-mouthed, ever-kvetching white teacher at Nya’s school done to pinched perfection by Janet Ulrich Brooks.